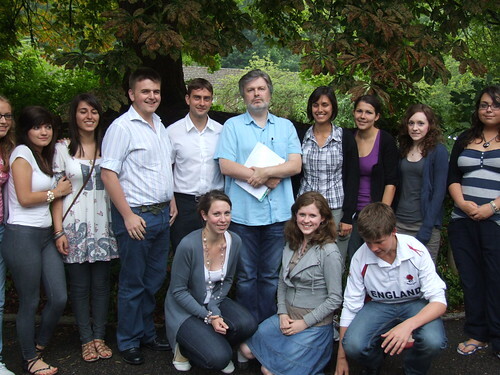 Each year, the Faith Movement invites a guest speaker to the Summer Session to give a lecture outside the chosen theme for the conference, and to bring something new to the experience of the young people gathered at Woldingham. Today we were privileged to have James MacMillan as our guest speaker. The Gloria, Sanctus, Memorial Acclamation and Agnus Dei for the Papal Masses at Bellahouston Park and Cofton Park will be his new compositions. (The Kyrie is to be Gregorian Chant - although the Mass he has composed has a Kyrie so that it can be used in parishes.) I understand also that there is to be a setting of the antiphon Tu es Petrus composed by James for the entrance of the Holy Father and before the Introit of the Papal Mass at Westminster Cathedral. We were also treated to some extracts from his work which were very striking. He helped us to understand them and to see the powerful spiritual message that can be given in music and poetry.